Curious? Come along to my first ever Webinar to find out more! Powered by the British Council. 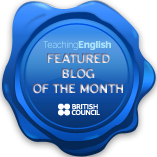 Tomorrow (that’s Thursday 28 June 2012) at 1pm to 2pm Central European Time, I am honoured to be giving a Webinar at the invitation of the British Council Teaching English team. I will be summarising and exploring the ideas and issues that you can read about in my recent posts on What makes a lesson GREAT? If you have read the posts, I hope to add some new thoughts and have a chance to discuss your ideas with you; if you have’t read them, this is a good opportunity to catch up quickly! The Webinar is being held in Adobe Connect and capacity is limited – so don’t be late or you won’t get a seat! PS: If you can’t make it, the British Council will be making the recording available online. Be good to see you, Chiew – I need your eye for detail!